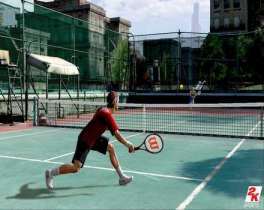 Tennis has been the one of the mainstays of electronic gaming, dating back to the days of Pong. With the release of Top Spin 2 on Xbox 360, this longstanding bedrock of electronic gaming continues its decades of dominance. The game itself offers an excellent, nuanced recreation of the sport with multiple shots and volleys, moves and modes. Top Spin 2's selection of real world players and courts adds to its authenticity. While the visuals are somewhat underwhelming, the game's solid play more than compensates with surprisingly deep controls and replay value. Taking players back to the court, Top Spin 2 is a follow-up to the successful Xbox game that offers more of the same solid gameplay mechanics, addictive multiplayer party modes and tight controls that made the original game so addictive. 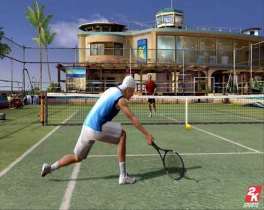 The game allows you to play as any one of 24 different professional players including such famous tennis stars as Roddick, Federer, Tommy Haas, Venus Williams and more. Each of these players has been recreated faithfully, and the game brings their own unique style to the court. In addition, the game lets you make your own 'Digital Identity', where your on-screen character represents your personality. Once created, each player is also ranked in various skill levels, allowing players to select different levels of opponents for each match. This allows you to practice basic techniques with lesser players and work your way up to the champions. The game lets you play either mixed or singles matches, and players can also set the number of wins for each match and other options at the start of each round. 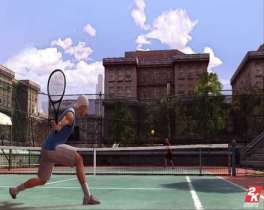 Top Spin 2's gameplay modes offer a variety of different approaches, players can choose to either play a single match or can delve deeper in the game's unique career mode, where you can trace a rising star from the beginnings on schoolyard courts until they reach the pros at the professional tournament level. During the career mode, players won't just need to defeat opponents, since they'll also face a number of training levels. These act as mini-games, where you need to complete a simple task, such as returning volleys or performing a specific type of shot before the timer runs out. When you've done this successfully, you earn points which you can use to increase your character's attributes and skill levels. As you progress through the career mode, you'll unlock additional items, such as extra outfits, rackets and accessories which allow you to further customize your character's appearance. These include hairstyles, shorts, shoes, sweatbands and more. Top Spin 2's approach to the sport is fairly straightforward in that the game doesn't drown the player in complexity. The controls are fairly easy to learn, with a few basic shots available to the player. Most of the strategy is deciding when to use standard shots, and when to take a chance on the riskier swings, which are harder for an opponent to volley, but also have an increased chance of falling outside the lines. The interface simple enough to give Top Spin 2 an immediate accessibility, but the depth provides you with the ability to learn new skills and perform a variety of shots including slices, drops, chops, lobs and drives. Setting up your shots requires a great deal of strategy and is a key element that determines whether you win the matches or not. The game's pacing is superb throughout, and players will find that the game offers plenty of intense action, whether it becomes fast deadly blows, or extended back and forth between the two players. Top Spin's single player mode is quite addictive and stands with the best tennis titles on the market. While some of the earlier opponents you face are somewhat predictable in their attack and shot patterns, the more skilled AI opponents keep you off guard and are much harder to score points against. This gives the game a very high replay value that pushes you to keep improving your game, while never seeming to become too difficult. The structure is excellent in this regard, and allows you to play either casually or more seriously, depending on your state of mind. Top Spin 2's single player mode is excellent and quite addictive, but the game really shines when you connect to Xbox Live, where you can compete against many other players. There are several modes of play, and you can select to either play against a single opponent, or compete in tournaments with the associated rankings and scores displayed. The simplicity of the game makes it ideal for online play, and matches are generally fast and speedy. The player matching and lobby system is straightforward and intuitive, allowing you to jump right into the action with little effort. The game's addictive play mechanics and intuitive controls are evident in the online modes as well. Unfortunately, the one area where Top Spin 2 falls a bit short is in its graphics. The player models don't look much more sophisticated than they would have on the original Xbox, with most still showing somewhat stilted animations and undetailed polygons that make them seem a bit behind the curve. The game's limited number of camera angles and cut-aways make it feel a bit thrown together as well, making for a game that doesn't quite live up to the console's promise. For a next-generation title, Top Spin 2 seems to make little effort at exploiting the Xbox 360's processing power and feels like something that's been ported over with minimal upgrades. To help mitigate this to some degree, the game's low retail price means it retails for about half the usual rate for an Xbox 360 title. This helps make the lack of polish easier to swallow, but no less disappointing. Despite the fact that Top Spin 2 lacks the production polish you'd expect a next-generation title to offer, it makes up for it with some solid gameplay. It's controls are intuitive and easy to learn, allowing you to jump right in and play a quick match, while not compromising the depth of moves and shots. If you want to go a bit deeper into the game, you'll find a number of interesting techniques to master. 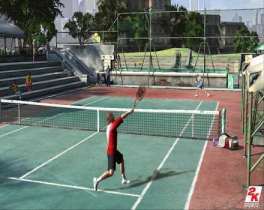 The standard tennis matches are enjoyable, but the party and mini-games add some variety and fun to the game as well. Top Spin 2's gameplay unfolds at a good pace, and it does a generally excellent job of recreating the feel and intensity of the sport. While it's not the most elaborate game on the system, this is a solidly enjoyable title that serves up an entertaining and occasionally challenging experience. Its low price makes it an excellent value, and should make a decent addition to the Xbox 360 library.